A moulded Euro 2-pin plug to IEC 7 Figure 8. The mains leads are rated at 2.5A and manufactured from 2x0.75mm2 approved cable. 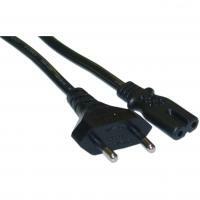 The C7 to Euro Plug CEE7/16, commonly know as a "Figure 8 lead" is used for powering some low powered appliances such as portable CD players, audio/video equipment and some laptop power supplies. A 2 Core Mains Figure 8 Euro Power Cable, 2-pin, in black, Suitable for lower powered appliances such as radios, portable devices and laptop power supplies. The Euro 2 PIN (EL 207) is a moulded 2 pin 250V 16A Class II plug. Also known as a CEE7/16 plug.This plug is approved for a wide range of EU countries.